Blog » Cruise the Amazon - With BirdNote! View the entire itinerary here. The Amazonian region boasts the highest diversity of birds and plants anywhere in the world. The very word “Amazon” brings to mind images of broad, sinuous rivers, tree-lined banks, strange animals, bright butterflies, and glorious sunsets. Along the rivers, watch for macaws and parrots flying overhead, ponderous Horned Screamers rising from stream banks, and exotic wildlife including sloths, fresh-water dolphins, snail-eating lizards, and a half dozen species of monkeys, and an amazing profusion of flowering and fruiting plants, including the Victoria Regia Water Lily and giant Kapok tree. The key to any Amazon River trip is comfort. 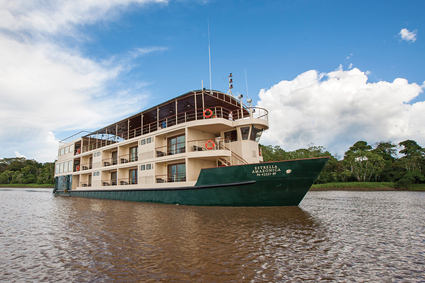 And the classically styled, triple-deck riverboat, La Estrella Amazonica (run by International Expeditions), offers the utmost in comfort, security, and safety while still permitting visits to remote and relatively unspoiled regions in Amazonia. The ship’s spacious cabins are individually climate-controlled, air-conditioned, and include private tiled bathrooms, hot-water showers, free laundry service, and bottled water available at all times. The riverboat features excellent food and an open-air upper deck for great wildlife viewing by day and stargazing by night. Optional pre- and post-trip extensions offer trips to the cloud forests of Northern Peru or to Machu Picchu. View the entire itinerary and sign up here.